Kaburagien established as a Japanese green tea wholesaler in 1897 by the Inejiro KABURAGI 1st when Tokyo was called Tokyo-fu. At that time, Kaburagien exported the Japanese green teas from the Yokohama international port to US. When the international port opened in Simizu in 1917, Kaburagien changed its business from exporter to domestic wholesaler because the distance from Tokyo to Simizu were long for Kaburagien by the transportation in early previous century. Kaburagien became the 1st wholesaler of Tokyo and kept its status. Inegiro KABURAGI 2nd succeed its business and golden age of Kaburagien started. Kaburagien kept oligopoly in north part of Tokyo. After world war 2nd ended. The diversified distribution channels of the Japanese green tea industry appeared and that is same in Tokyo and Kaburagien had lost its oligopoly but Kaburagien kept its advantage as the Japanese green tea wholesaler in Tokyo. Kaburagien opened retail branch in 1947 and its business is steadily grow. The time of a Japanese economic boom from late 1950th many Japanese companies invested and became big but Inegiro KABURAGI 2nd ‘s way is not invest unreasonable. Kaburagien run as steady small company in the period. Isao KABURAGI ( 3rd generation) joined Kaburagien in 1963 and Isao KABURAGI grow Kaburagien firmly and steadily with the economic boom in Japan from 1960th. 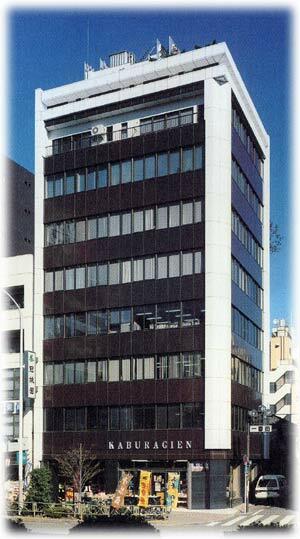 Isao KABURAGI built 9th floor office building and made Kaburagien as corporation. In this period, Japanese green tea industry whole is prospered. In 1980th “convenience” required to the Japanese green teas. Under Isao KABURAGI’s presidency, Kaburgaein.Co.Ltd continuously grow and Kaburagien Co.Ltd welcome the 100years anniversary in 1997. (Isao KABURAGI also worked for development of Japanese green tea industry as the broad of directors of the Japanese green tea Tokyo association through 1980th and 1990th. The Japanese green tea industry’s campaign “ The Japanese green tea are good for health” is Isao KABURAGI’s proposal and he implemented.